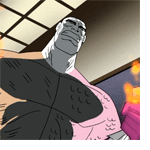 A confused Mason/Metamorpho is finally convinced the League is there to help him. Together they race to head off the newly transformed Stagg before he kills Mason’s fiancé – his own daughter. I liked that Hulk movie with the exception of not liking the CGI Hulk. But I prefer the Ed Norton one myself. I think there’s a thing going where a lot of comic book movies are “just action movies” with comic book stars. They could as easily be James Bond or something most of the time….